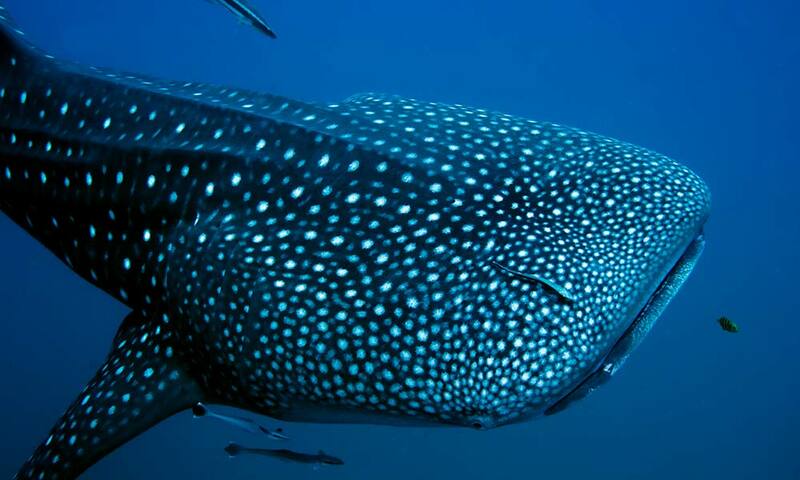 The whale shark is the largest fish in the ocean and is a regular visitor to the Galapagos Marine Reserve. Whale sharks are the largest species of shark and the largest fish alive today. They have a circum-global distribution, occurring in all warm and temperate seas other than the Mediterranean, and are a migratory species. At a number of coastal locations, predictable aggregations of whale sharks occur at certain times of year. These are often referred to as ‘whale shark seasons’ and are normally associated with a local burst in productivity such as a coral or fish spawning event. Whale sharks are primarily planktivores but they will also eat small fish from time to time. They are regularly observed swimming close to the surface with their mouth open in a feeding behaviour known as ram-filtration which channels plankton-filled water into their mouth. Whale sharks do possess teeth, although they are not used as part of feeding. Teeth measure up to 3mm and individuals may possess in excess of 3,000 teeth at any one time. The flanks and upper surface of a whale shark are typically grey to blue with white spot patterns (unique to individuals) in between vertical and horizontal stripes representing a chequerboard. The head is broad and flattened, with a large terminal mouth up to 1.5 metres wide. Their eyes are small in comparison to body size and located just behind the mouth. There are three prominent ridges running down the length of the back and five large gill slits on either side of the head just in front of the pectoral fins. The first dorsal fin is midway down the body and significantly larger than the second dorsal fin. Reports of maximum sizes are largely unreliable. The largest confirmed individual had a length of 12.65 metres but they are thought to reach between 18 and 20 metres. Similarly with weight, the heaviest confirmed report was a shark weighing in at 21.5 metric tons, but they are thought to reach in excess of 30 metric tons. Growth rate is unknown due to data deficiency and logistical problems with gaining accurate age data. Maximum age is estimated to be as much as 100 years. It is also unknown, to date, what their reproductive cycle is, or where they give birth, though we do know that they give birth to live young. In Galapagos, 90% of the whale sharks seen appear to be pregnant females, though research is still underway to discover why. Where to see them: Whale sharks are most commonly seen in the north of the Galapagos Marine Reserve, close to the islands of Wolf and Darwin. 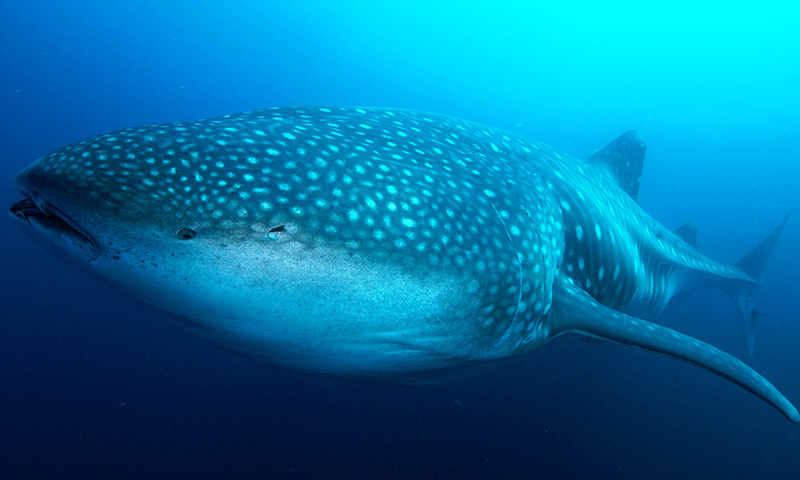 When to see them: Whale sharks are regularly sighted between June and November. Threats: Whale sharks are still targeted by a number of commercial fisheries throughout the world (learn more here). They are also often caught as bycatch, and are at risk from serious injury through ship strikes. 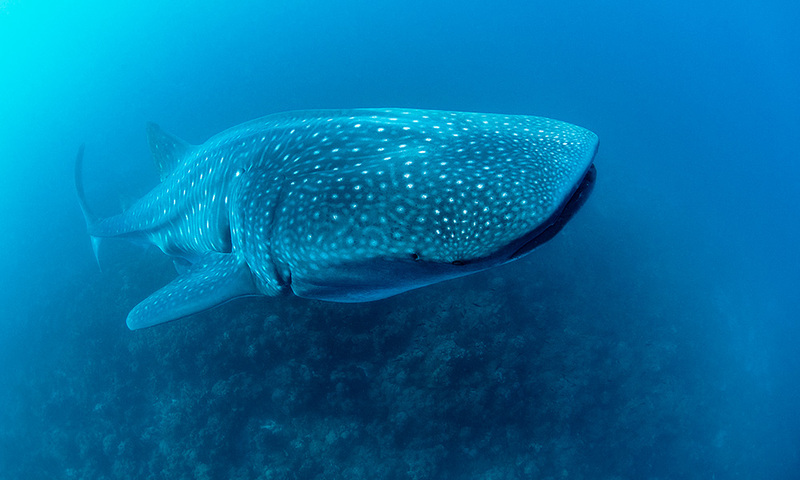 Conservation actions: We support the Galapagos Whale Shark Project which aims to improve our understanding of how whale sharks use the Galapagos Marine Reserve and hopes to uncover the elusive pupping ground of these giant fish. This is part of our wider Endangered Sharks of Galapagos programme. Help us protect whale sharks by donating today! The Galapagos Whale Shark Project, supported by Galapagos Conservation Trust, aims to increase our knowledge about the world's largest fish including what their migratory patterns are, and whether the majority of individuals seen in Galapagos are actually pregnant females. 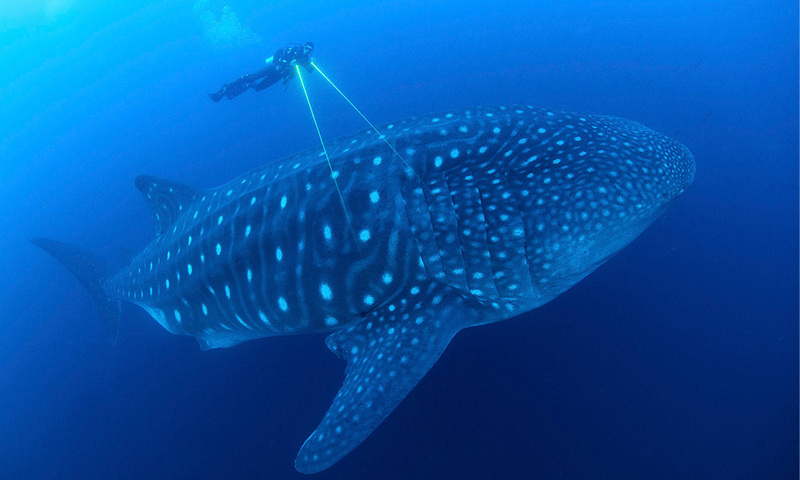 Learn more about the Galapagos Whale Shark Project and how you can help support the conservation of this gentle giant.